Find a euphemism or an acronym and blood, sweat, tears, pain, urine and cholera-infested excrement disappear like a snowman in the sun. IDP's - internally displaced persons - I read this abbreviation in articles about the "refugee problem" (that's one we were already used to) in Pakistan. How many IDP's are there at the moment, approximately? The provincial government estimates between 150,000 to 200,000 people have arrived in safer areas of North West Frontier Province (NWFP) over the last few days, with another 300,000 on the move or about to move. 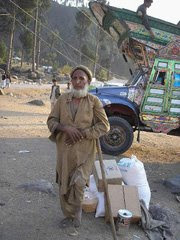 Those fleeing the latest escalation of hostilities in Lower Dir, Buner and Swat districts join another 555,000 previously displaced Pakistanis who had fled their homes in the tribal areas and NWFP since August 2008 and who had already been registered by NWFP authorities and UNHCR. The vast majority of the earlier arrivals – more than 462,000 people – are staying in rental accommodation or with host families. Another 93,000 are staying in 11 camps supported by UNHCR, other UN humanitarian agencies, non-governmental organizations and the Red Cross and Red Crescent family. So we can infer that the IDP-story is about more than a million human beings. It is all a matter of the omelet and the eggs, probably, for Islamabad and Washington DC. It happens, in the War Against Terror. This was the Cambodia-moment for Brand Obama, and he passed the test: no protest of any importance in the US of A. He can get away with it. Incredible. But even if the Swat Valley can be (re-)conquered by the Pakistani regime its problems will not be over.